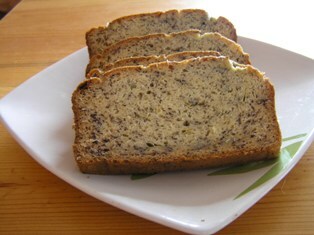 Moist and delicious banana bread that is easy to make, just follow simple steps here. Begin by mixing the kefir and flour in a bowl and leave it for 12 to 24 hours prior to making bread. Then cover to let the flour soak. Meanwhile preheat the oven to 300F. Next, mix together in a large bowl the sugar, butter, vanilla, eggs, bananas, and nuts. Then add the kefir-flour mixture into the bowl and mix until blend. Add the baking soda and baking powder and mix just until blended. Then pour the batter into a greased bread pan (9×5-inch). Moist, intensely flavorful chocolate zucchini cake with Kefir. A perfect way to enjoy chocolate without worrying calories. Combine the butter and oil together and mix. Then add in the kefir, cocoa powder, grated zucchini, eggs, vanilla and maple syrup. In a separate bowl, combine the dry ingredients together. Then add one cup of dry ingredients into the butter and oil mixture and mix well until combine for about 2 minutes. (Remember to add the dry ingredients one at a time). Next is to pour the batter into a greased baking pan and bake for about 40-45 minutes at 350 degrees. If your using a bundt pan, increase the time of baking to 10 minutes. For the chocolate topping, on a low heat place the chocolate in a double broiler and stir until chocolate is melted. Remove from the heat and add the kefir and stir until well combined. 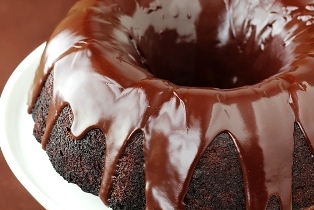 Finally, drizzle the melted chocolate over the cake.